When project inspiration strikes, we’d love to do some quick tests immediately to investigate feasibility. Sadly we’re usually far from our workbench and its collection of sensor modules. This is especially frustrating when the desired sensor is in the smartphone we’re holding, standing near whatever triggered the inspiration. We could download a compass app, or a bubble level app, or something similar to glimpse sensor activity. But if we’re going to download an app, consider Google’s Science Journal app. It was designed to be an educational resource, turning a smartphone’s sensor array into a pocket laboratory instrument and notebook for students. Fortunately it will work just as well for makers experimenting with project ideas. The exact list of sensors will depend on the specific iOS/Android device, but we can select a sensor and see its output graphed in real-time. This graph can also be recorded into the journal for later analysis. Science Journal was recently given a promotional push by the band OK Go, as part of their OK Go Sandbox project encouraging students to explore, experiment, and learn. This is right up the alley for OK Go, who has a track record of making music videos that score high on maker appeal. Fans would enjoy their videos explaining behind-the-scene details in the context of math, science, and music. An interesting side note. Anyone who’s been to Hackaday Superconference or one of the monthly Hackaday LA meetups will likely recognized the venue used in many of the OK Go Sandbox videos. Many of them were filmed at the Supplyframe Design Lab in Pasadena. It’s also nice to see AnnMarie Thomas (Hackaday Prize Judge from 2016 and 2017) collaborated with OK Go for the Sandbox project. While the Science Journal app has provisions for add-on external sensors, carrying them around would reduce its handy always-available appeal. Not that we’re against pairing smartphones with clever accessories to boost their sensing capabilities: we love them! From trying to turn a smartphone into a Tricorder, to an inexpensive microscope, to exploring serious medical diagnosis, our pocket computers can do it all. Most spy movies (at least the ones worth their salt) will include a few scenes that depict nerds in a van listening in on conversations remotely and causing the victims phones to do things like turn themselves or their cameras on. We have been made to believe that it takes an entire van of equipment and one or two MIT level hackers to pull this off. Turns out all it takes is about $2300, some know how, and an unsuspecting target with a set of microphone-equipped headphones attached to their phone. The French Government’s information security research group ANSSI has been investigating this and published a paper with their findings. Unfortunately that paper is behind a paywall. Wired has a pretty good summation of the findings, which use a transmitter to induce a current in the headphone wires. This in itself isn’t surprising. But they’re able to do it with such accuracy that it can both trigger, and successfully interact with the hands-free features provided by Siri and Google Now. We think this is a really cool proof-of-concept. It’s mentioned that an attacker could potentially use this to make calls or do other things that cost the victim money. We think it’s more likely to be implemented by resourceful young engineers as a practical joke. Rick Rolling is a poplar go-to. But if you can make the phone “hear” audio, you should also be able to make someone wearing headphones hear ghosts. This has a lot of potential. The first one to make this happen really needs to let us know about it. Although scientists have known about Ultra-High Energy Cosmic Rays (UHECRs) for years, nobody can pinpoint their origin. When these UHECRs hit the ground, however, they cause a widespread local disturbance called an air shower. This air shower is a wide dispersion of photons, muons, and electrons at sea level. The means of observing this air shower mandates a widespread geographic region for detecting them. One solution would be a very big detector. Physicists [Daniel] and [Michael] discovered an alternative to pricey hardware, though. By leveraging the CMOS sensors in our smartphones, they can borrow some CPU cycles on our phones to create a worldwide detector network. According to their paper, the CMOS camera in our smartphones is sensitive to the spectrum of radiation induced by muons and photons from these air showers. With an app running on our phones, [Daniel], [Michael], and other scientists can aggregate the data from multiple detections in a similar region to better understand their origins. If you’re concerned about CRAYFIS taking away from your talk or web-browsing time, fear not; it runs in the background when a power source has been detected, hopefully, when you are asleep. It’s not the first time we see scientists tap into our computing resources, but this is certainly an achievement made possible in only the last few years by the sensor-loaded smartphone that charges on many of our night stands. With over 1.5 billion smartphones active in the world, we’re thrilled to see a team cleverly leveraging a ubiquitous and already-well-distributed resource. Love them or hate them, plenty of people around the world use QR codes on a daily basis. Since he thinks they’re pretty great, Hackaday reader [falldeaf] thought it would be cool to put together an automatic QR code generator to be used on web sites. Inspired by the custom QR logo embedding work done by our own [Brian Benchoff], his dynamic QR code generator allows you to do the same thing, but with far less work. The code requires that you have PHP and the GD library installed on your server, but other than that his code does the rest. All you need to do is call up the page and pass along a URL, optional caption text, optional image overlay (to add your logo to the center of the code), as well as an optional hash code for tracking traffic sources. The page spits out a png image that can be used on its own, or embedded in a blog, which is what [falldeaf] plans on using it for. 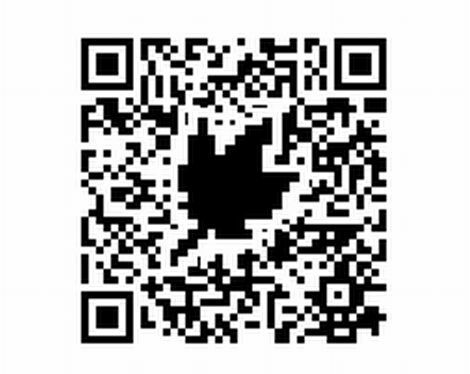 If QR codes are your thing, be sure to grab a copy of his code, it will certainly be a handy tool to have around. Don’t you hate that feeling, the one you get when you have just realized that you have no clue where you may have left your keys? If you are unlucky enough to have lost them in a public place, odds are they are as good as gone. Pumping Station One member [celtwolf] thought it would be great if your keys could help someone contact you instantly upon finding them, so he created a key fob that did just that. SMS can use a similar URI scheme as the “mailto” protocol we are all familiar with, so [celtwolf] generated a URI that would send a text to his mobile phone with the message “I found your keys!”. He generated a QR code from the URI, then etched it on a piece of acrylic using a laser cutter. He filled in the recessed portions with a dark polymer clay, baked it, then coated it with a layer of nail polish for added durability. 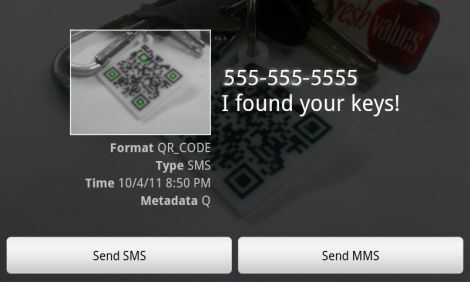 Now, if anyone finds his keys and takes a picture of the QR code with their smartphone, he will immediately receive a text letting him know they are safe and sound. What a great idea!